UFC bantamweight champion TJ Dillashaw may be staring down flyweight champion Henry Cejudo on Saturday night in Brooklyn but he’s already looking beyond that. In an Instagram video, TJ made it clear he would move up to 145 and fight UFC featherweight king Max Holloway. That’s a pretty bold statement for a number of reasons with the first being that Holloway is an absolute beast. 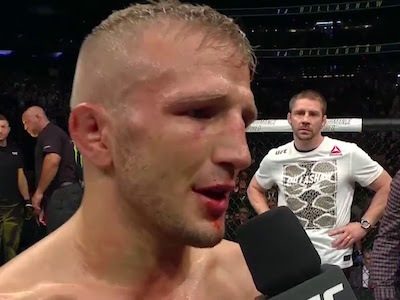 Still, Dillashaw made it clear he was serious about the move up. Would I move up to 145 ? Absolutely, man. I would love to. I’m a professional. I train hard. Making ’25s has been a process in its own… To get my body down there and do it the right way. ’45s would have to be the same thing, it would be a lot of work. Right now I’m in love with food because I don’t get to eat as much of it. If I went ’45s I’d hate it because I’d be doing nothing but stuffing my face but that’s definitely something I would love to do. Even if you did think he was off his rocker it doesn’t matter. Dana White seems all for it going by what he said on ESPN’s Get Up! He’s talking about moving up to 145 pounds to fight Max Holloway. Max Holloway is so much bigger than him… It’s pretty crazy, but impressive. I like his style. I like what he’s thinking. He’d be the first three-belt champion if he could pull that off. What do you think? Should TJ move up if he beats Cejudo?